Returning Federal Land To The Natives? There is a satirical story floating the web these days that claims President Barack Obama has signed an executive order that returns about 300 million acres of federal land, including the national parks, worth an estimated $450 billion, to the Native American tribes. As a personal friend to many of the tribal members in Arizona, and having lived with and worked as a news reporter on the Navajo, Hopi and Apache reservations, I was at first overwhelmed with a sense of gratitude when first reading those headlines. But when checking more closely I realized that the story was published in something called the Satira Tribune, another on-line publication specializing in satirical attacks on things our government should be doing but probably never will. Mr. Obama has indicated that he is willing to settle a century old Black Hills claim dispute involving the Lakota and Sioux tribes in South Dakota and Wyoming. A case filed in the early 1920s claimed that the United States never made a legitimate purchase of the land that now includes six national parks including Mount Rushmore. 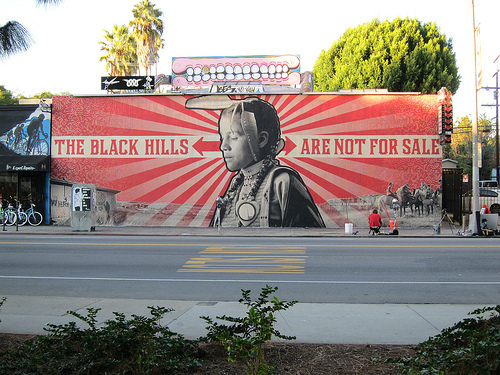 The U.S. Court of Claims in a 5-2 ruling in 1979 determined that the 1877 Act that seized the Black Hills from the Sioux was a violation of the Fifth Amendment. The court awarded the tribe $17.5 million with five percent interest totaling another $105 million. A second case claiming a similar violation involving the Fort Laramie Treaty of 1868 brought an award of another $44 million. But the tribes living in the area did not wish to officially sell the land and refused to accept the payment. Thus the issue has remained in limbo. The Black Hills is a uniquely beautiful area of mountainous land long considered sacred by the tribal people. They want it returned and want the right to hunt there. But the area, which is also home to Mount Rushmore, the Badlands National Park, Devils Tower, Jewel Cave, Wind Cave and the Minuteman Missile National Historic Site, also has evolved into a popular tourist attraction. The only real solution appears to be an acceptance of money for the true purchase of the land, since it is obvious that nothing will ever be returned to the way it was at the time the property was seized.